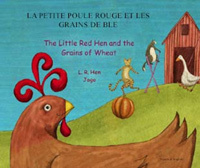 Little Red Hen finds some grian of wheat but when she ask the cat, the dog and the goose to help her plant them, they are all too busy. When Little Red Hen has finally grown the wheat, harvested it, turned it into flour and baked the bread the others are only to willing to help her eat it - but will she let them? The gentle repetition and humorous second story unfolding in the illustrations makes this a joyful retelling of the classic fable.